A rook (♖ ♜ borrowed from Persian رخ rokh, Sanskrit रथ ratha, "chariot") is a piece in the strategy board game of chess. Formerly the piece was called the tower, marquess, rector, and comes (Sunnucks 1970). The term castle is considered informal, incorrect, or old-fashioned. In algebraic notation, the white rooks start on squares a1 and h1, while the black rooks start on a8 and h8. The rook moves horizontally or vertically, through any number of unoccupied squares (see diagram). As with captures by other pieces, the rook captures by occupying the square on which the enemy piece sits. The rook also participates, with the king, in a special move called castling. The white rook can move to any square marked with a white dot. The black rook can move to squares with a black dot, or it can capture the white pawn on e7. In the medieval shatranj, the rook symbolized a chariot. The Persian word rukh means chariot (Davidson 1949:10), and the corresponding pieces in east Asian chess games such as xiangqi and shogi have names also meaning chariot (車). Persian war chariots were heavily armoured, carrying a driver and at least one ranged-weapon bearer, such as an archer. The sides of the chariot were built to resemble fortified stone work, giving the impression of small, mobile buildings, causing terror on the battlefield. However, in the West the rook is almost universally represented as a crenellated turret. One possible explanation is that when the game was imported to Italy, the Persian rukh became the Italian word rocca, meaning fortress, and from there spread in the rest of Europe. Another possible explanation is that rooks represent siege towers - the piece is called torre, meaning tower, in Italian, Portuguese, and Spanish; tour in French; toren in Dutch; Turm in German; and torn in Swedish. An alternative name in Russian: тура (pronounced as toura). Finally, the chariot was sometimes represented as a silhouette, a square with two points above representing the horse's heads, which may have been seen to resemble a building with arrowports to the medieval imagination. An exception is seen in the British Museum's collection of the medieval Lewis chess pieces in which the rooks appear as stern warders or wild-eyed Berzerker warriors. Rooks usually are similar in appearance to small castles, and as a result a rook is sometimes called a "castle" (Hooper & Whyld 1992). This usage was common in the past ("The Rook, or Castle, is next in power to the Queen" - Howard Staunton, 1847) but today it is rarely if ever used in chess literature or among players, except in the expression "castling". The Russian name for the rook (ladya) means a sailing boat or longship of Northern cultures such as the Vikings. In general, rooks are stronger than bishops or knights (which are called minor pieces) and are considered greater in value than either of those pieces by nearly two pawns but less valuable than two minor pieces by approximately a pawn. Two rooks are generally considered to be worth slightly more than a queen (see chess piece relative value). Winning a rook for a bishop or knight is referred to as winning the exchange. Rooks and queens are called heavy pieces or major pieces, as opposed to bishops and knights, the minor pieces. White has one rook on his 7th rank here. In the opening, the rooks are blocked in by other pieces and cannot immediately participate in the game; so it is usually desirable to connect one's rooks on the first rank by clearing all pieces except the king and rooks from the first rank and then castling. In that position, the rooks support each other, and can more easily move to occupy and control the most favorable files. A common strategic goal is to place a rook on the first rank of an open file (i.e. 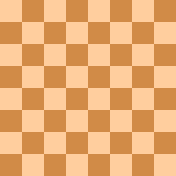 one unobstructed by pawns of either player), or a half-open file (i.e., one unobstructed by friendly pawns). From this position, the rook is relatively unexposed to risk but can exert control on every square on the file. If one file is particularly important, a player might advance one rook on it, then position the other rook behind - doubling the rooks. A rook on the seventh rank (the opponent's second rank) is typically very powerful, as it threatens the opponent's unadvanced pawns and hems in the enemy king. A rook on the seventh rank is often considered sufficient compensation for a pawn (Fine & Benko 2003:586). In the diagrammed position from a game between Lev Polugaevsky and Larry Evans, the rook on the seventh rank enables White to draw, despite being a pawn down (Griffiths 1992:102-3). Two rooks on the seventh rank are often enough to force victory, or at least a draw by perpetual check. Black has two connected rooks on his 7th rank here. Rooks are most powerful towards the end of a game (i.e., the endgame), when they can move unobstructed by pawns and control large numbers of squares. They are somewhat clumsy at restraining enemy pawns from advancing towards promotion, unless they can occupy the file behind the advancing pawn. By the same token, a rook best supports a friendly pawn towards promotion from behind it on the same file (see Tarrasch rule). In a position with a rook and one or two minor pieces versus two rooks, generally in addition to pawns, and possibly other pieces - Lev Alburt advises that the player with the single rook should avoid exchanging the rook for one of his opponent's rooks (Alburt 2009:44). The rook is a very powerful piece to deliver checkmate. Below are a few examples of rook checkmates that are easy to force. A king and rook mate. The king and rook work together to force the enemy king to the edge of the board, where it can be checkmated. Chess rooks frequently occur as heraldic charges. 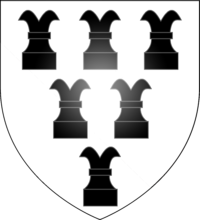 Heraldic rooks are usually shown as they looked in medieval chess-sets, with the usual battlements replaced by two outward-curving horns. They occur in arms from around the 13th century onwards. In Canadian heraldry, the chess rook is the cadency mark of a fifth daughter.